Living up to its name, Deception Bay in Queensland, Australia left onlookers deceived by what lay in front of them. 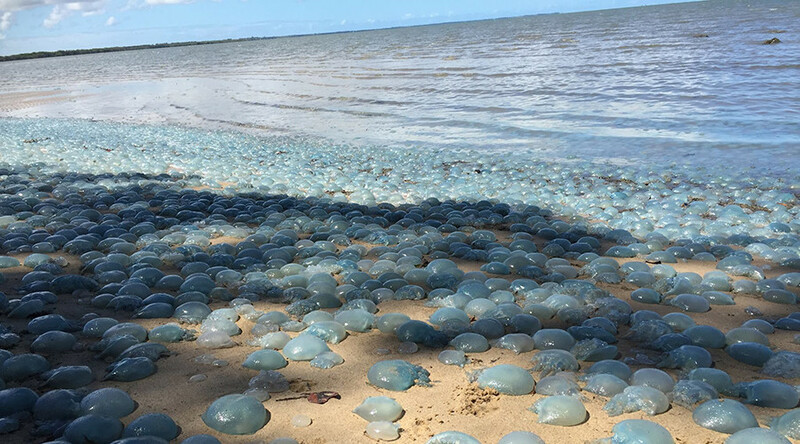 What looked like bubble wrap was, in fact, numerous blue jellyfish spread across the beach. The beach, near Brisbane’s north side, received its wobbly visitors on Sunday, and many of the blue stingers have been hanging around ever since. “They're already starting to smell," said Charlotte Lawson, who first photographed the jellyfish carpet. At first, Lawson thought the jellyfish was just the tide having come in. “When we got closer we realized it was jellyfish,” she said. “It happens every year but there's never been this many, this year it's been heaps." The jellyfish are blue blubber jellyfish and are mildly venomous. "It's like wallpaper," Marine biologist Lisa-Ann Gershwin told ABC News. "They are just cheek by jowl. They are packed so tightly. It's a sea of blue." Gershwin said she had never seen so many jellyfish in her 25 years of research, and suggested the jellyfish cluster could have been caused by warmer waters, tide conditions, a lack of predators and other factors.